What sewing machine/overlocker do you use? When I started sewing I bought a really cheap sewing machine, an AEG 1714, on Amazon for just 99€ and used it for my first five years of sewing. It still works fine, but I treated myself to a computerised machine and am using a W6 N5000 now, which I absolutely love and recommend. If you’re a newbie to sewing, I’d always recommend buying a cheaper one first. 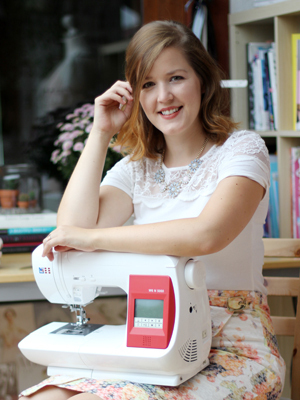 If you’re still into sewing a few years later, you can still upgrade to a better one! I also use an overlocker; it’s a Janome 9200D. Which dress form/tailor’s dummy do you have? Again, I bought a rather inexpensive one on Amazon. Last year I padded it so it now has my exact measurements. You can read about that here. 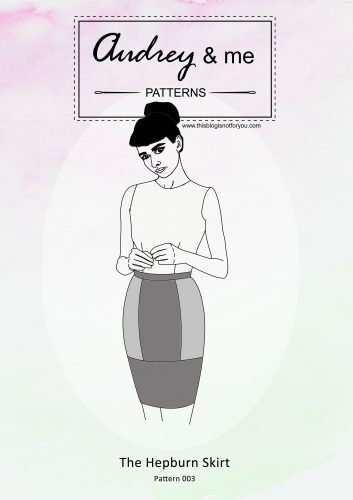 What patterns do you use and where do you buy them? When I started sewing I only used Burdastyle patterns. I still use them a lot! Last year I started trying out different indie patterns, such as By Hand London, Megan Nielsen, Collette and PDF patterns by other bloggers. I love supporting independent businesses! 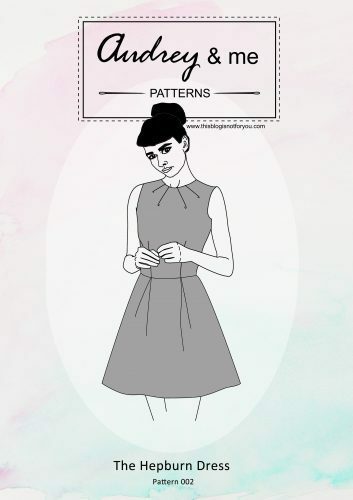 I now also draft a lot of patterns myself and launched my own little PDF pattern company Audrey & Me. I have released four patterns so far, two of them are pay-as-you-wish products. I use a Canon EOS 60D. I design and draw everything myself and Mr Thisblogisnotforyou takes care of the technology. I’m a very lucky girl! I started blogging about in 2012. It took me a few months to figure out what sort of blog this was going to be. It started as a personal blog but changed into a sewing & craft blog pretty quickly! For these last years I have been blogging quite regularly, taking the odd little blogging break every now and then to recharge & refocus. No, I’m not. And right now I think I wouldn’t want to be one. I love blogging and I spend quite a bit of time on it, but I’m a psychologist by trade – something I wouldn’t want to give up! When I started This Blog in 2012, I lived in London, UK. I absolutely loved living and working there for a few years. The sewing community in London is amazing. In 2015, we moved back to Germany and I now live near Munich in Southern Germany. I’ve just started my own blog. Can you give me advice? You’re lucky! I’ve written a whole series on starting a blog which is full of blogging advice from newbie to newbie. I never was taught how to sew – all I know about sewing is self-taught. I use a lot of books and online resources to look up things and learn new techniques. I loved sewing as a child and made dresses for my Barbie dolls from old clothes. When I was a bit older I started to refashion clothes just with needle and thread. My true sewing passion started when I befriended a girl in my first flat share who owned a vintage sewing machine given to her by her grandmother. It really was love at first stitch, as I always dreamt of owning a sewing machine. I used it more than she did back then, although I had no clue what I was doing. It was basically trial and error learning since I was overly ambitious from the beginning and the first projects were more unpicking than sewing, mostly ending up in the bin. When my roommate moved out, I bought myself a cheapo-sewing machine I’ve used for the first five years before getting a computerised machine. I started off making bags, wallets, accessories. I’ve always loved refashioning my clothes and having a sewing machine opened up a new world to me. In 2011, a year before starting Thisblogisnotforyou.com, I began making my own clothes: dresses, trousers, skirts, shirts etc for myself and others. I became more and more ambitious and eager to learn about technique, pattern drafting and fitting. I haven’t looked back! Can I share your DIY projects and tutorials on my blog? I love to share my projects and ideas, but please DO NOT post the entire content of any tutorial or blog post without written permission. Thisblogisnotforyou is licensed under a Creative Commons Attribution-NonCommercial-NoDerivatives 4.0 International License. It is okay to share one or two pictures, indicating the source, and always link back to the original post on this website. If you are a print publication wanting to use an image or have any other questions about usage of a photo on this website, please email me at: hello AT thisblogisnotforyou DOT com. Do you check out and read your followers’ blogs? Oh, yes! 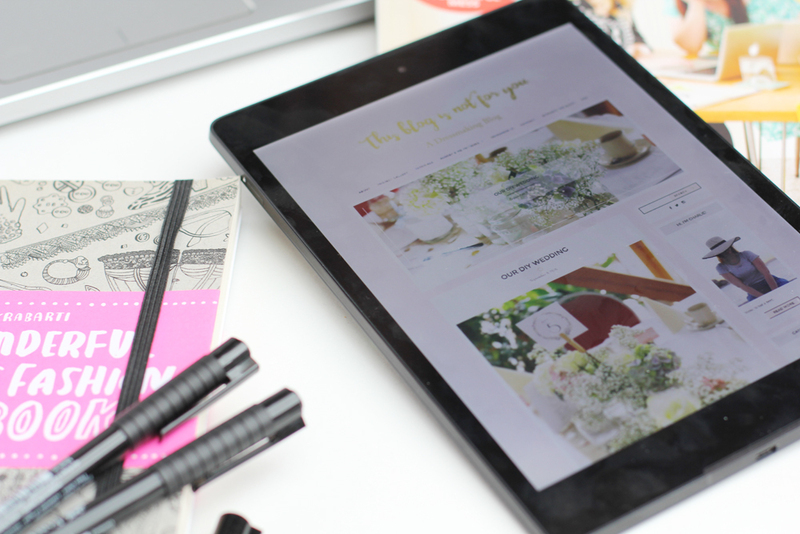 I love reading blogs as much as I love blogging! I always check out the blogs of my readers and have a wide range of craft and sewing blogs in my bloglovin’ feed. It would be too hard to narrow it down to just a few! 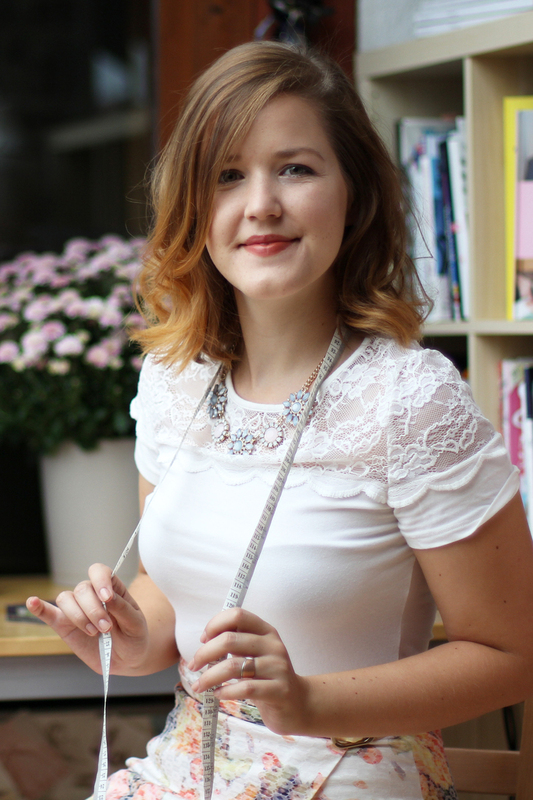 I love some of the very popular sewing and DIY blogs (e.g. A Beautiful Mess, Tilly and the Buttons, Sew Over It), but I also frequently read the blogs of my blogger friend’s and readers. I especially enjoy reading blogs of people who’ve just started the whole sewing/blogging thing and watch them grow. I used to buy almost all my fabric in fabric stores in London. I still have a massive stash left! After moving, I buy fabric at local fabric stores near where we live in Germany. Also, I use a lot of secondhand fabrics and clothes for refashions which I buy in local charity shops. I’m not a big fan of buying fabric online. I’m the type of person that needs to feel the fabric with their hands before I can decide if it’s the right thing. I had some very disappointing experiences with buying fabric online (but occasionally some nice surprises, too). Can you suggest some places to go fabric shopping in London? I go fabric shopping on Goldhawk Road (Tube: Goldhawk Road station) and Walthamstow Market (Tube: Walthamstow Central). There a are some amazing fabric stores in Soho on and near Berwick Street, but they’re way too expensive for my taste. Can you recommend some online fabric shops? As I said, I only very rarely order fabric online so I don’t have any go-to online fabric shops. I always do a lot of googling before I find the right thing for the best price. Sew Over It does always have very high-quality fabrics – I’ve never been disappointed buying there. Can I contribute an article or guest post to your site? I’m sorry, but at the moment I like to create all of the content for this blog myself. Can you recommend a good sewing book? First of all, I love sewing and craft books! Can I sponsor your blog or place ads on your sidebar? Yes you can! Find out more about my ads and sponsering options here. Yes I do, occasionally! There are a lot of great companies in the sewing world that I appreciate and love to work with. If you are interested in working with me, please visit this page. There are no hidden ads on this blog. All collaborations are indicated by a “courtesy of/provided by”. All reviews are completely honest. I will not recommend products I would not appreciate or use myself. Do you have a question that I haven’t answered yet? Drop me a line at hello AT thisblogisnotforyou DOT com or leave me a comment! I thought this question would be answered in the About or the FAQ- why is your blog called thisblogisnotforyou?